When you are looking for a new type of firearm to add to your collection, you might hesitate when someone suggests an AR-15 pistol. The AR-15 pistol is a fascinating weapon, but it suffers from the reputation and controversies surrounding assault rifles in general. Contrary to popular belief, AR doesn’t stand for “assault rifle,” but rather Armalite, a trademark currently owned by the Colt company. As such, you can’t simply apply the same principles and stigmas to all AR-15 models that the general public usually applies to automatic weapons and assault rifles. The AR-15 pistol does, however, have its own set of concerns and important considerations to be aware of. Let’s separate the fact from the fiction regarding AR-15 pistols so you can determine if it is the right firearm for you. We’ll also highlight the versatility and customizability of this fascinating weapon. What Is an AR-15 Pistol? Simply put, an AR pistol is a pistol-length AR-15 with no stock. Because of their compact size, these pistols are quite comfortable in small, confined spaces. The most common caliber is .223, but other variants exist, including 9mm. In place of a stock, an AR-15 pistol usually has a pistol buffer tube or similar piece. 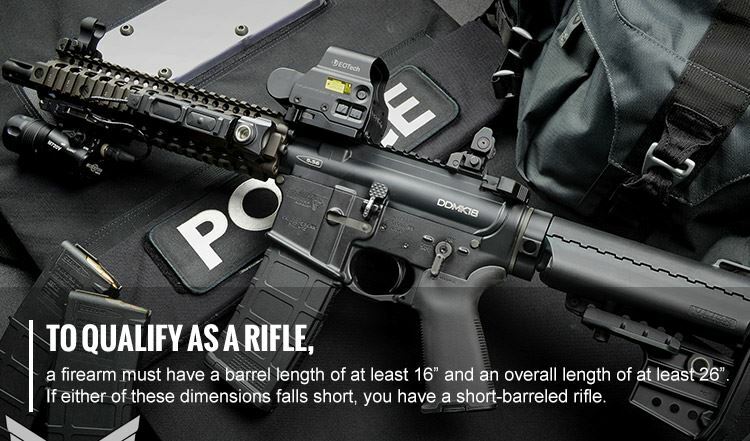 An AR-15 pistol also has a barrel shorter than 16” - the minimum legal length for a rifle barrel. What happens if you put a stock on a pistol with a barrel length shorter than 16”? You’ve made a short-barreled rifle, and you owe the U.S. Government some paperwork and $200 for a tax stamp to make it legal. And technically, you need to have that tax stamp in hand before you put that gun together. If you are planning to assemble a pistol, make sure you don’t use parts that used to be assembled as a rifle. The attraction of the AR rifle and the AR pistol is that you can assemble them yourself. Parts are interchangeable and plentiful, so you can run yourself into trouble if you’re not careful. But you can also swap and reconfigure your pistol as many times as you like until you find a configuration that works for you. Additionally, installing a vertical fore grip turns your pistol into an AOW (any other weapon) in the eyes of the ATF, which again requires the stamp and paperwork. As you may have noticed, it is easier to explain what an AR-15 pistol is by explaining what it isn’t. Generally speaking, an AR pistol is legal, as long as what you have is a legal AR pistol. What do we mean? The AR pistol as a category of firearm is legal in most states and municipalities. Of course, we aren’t trying to make blanket statements about all 50 states in the USA, and there are exceptions and more restrictive rules in California, among other states. That said, the AR-15 pistol is such an unusual class of firearm that it could be easy to accidentally construct something other than the AR-15 pistol you intended to build. For instance, say you buy an AR-15 pistol with the intention of later affixing a stock and converting it into a short-barreled rifle. You have submitted the paperwork and your $200 check, and you are willing to wait the six to eight months it will take for the government to process your application and send your tax stamp. Lots of people do this - it’s a way to still use the gun while you are waiting for the stamp to complete the legal conversion. Well, if you were to affix that stock before the tax stamp arrives in the mail, you have constructed a short-barreled rifle for which you do not possess a tax stamp. Therefore, you are in unlawful possession of that particular firearm. 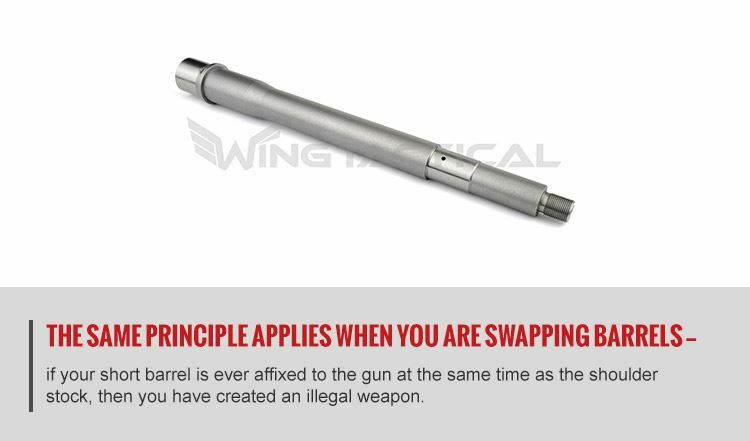 The same principle applies when you are swapping barrels - if your short barrel is ever affixed to the gun at the same time as the shoulder stock, then you have created an illegal weapon - assuming you don’t have a tax stamp for that particular firearm. And if you purchased that gun as an AR pistol, you probably don’t have a tax stamp for it. So that’s what we mean when we say that AR-15 pistols are legal as long as you have a legal AR-15 pistol. It’s not the legality of a properly constructed AR-15 pistol that’s the pertinent issue here. It’s the possibility of accidentally constructing a firearm of some other type, be it an SBR (short-barreled rifle) or AOW, that presents the legal issue. If you are a tinker or a home builder, it is also important to understand the legal framework surrounding firearm conversions. We mentioned that putting a stock on your AR-15 pistol automatically makes it a short-barreled rifle. But if you register a rifle, you can never take that gun apart and use its parts to create a pistol. There is no tax stamp to cover this action - it is simply illegal. However, if you register your AR as a pistol, you may convert that gun to a rifle and back as many times as you would like. It’s confusing and slightly inconsistent, but it’s the current letter of the law. What's the Difference Between an AR-15 Pistol and an AR SBR? So if an AR-15 pistol is a variant of an AR-15 rifle with a shorter barrel and no stock, what is the difference between an AR-15 pistol and an AR short-barreled rifle? To answer this question, it is helpful to take it another step further and cover the ATF’s definition of a rifle. To qualify as a rifle, a firearm must have a barrel length of at least 16” and an overall length of at least 26”. If either of these dimensions falls short, you have a short-barreled rifle. Is this a bad thing? Certainly not, as long as you don’t mind paying for the tax stamp and waiting for the paperwork to come through. That’s the end of the story though, right? Well, not quite. As we mentioned before, pistols can’t have stocks. Only rifles have stocks. So even if your gun has a barrel shorter than 16” and is shorter than 26” overall, if you put a stock on it, you have a short-barrel rifle. Hey, you can’t expect rules created in different eras and by different government agencies to fit together, can you? In practical terms, that shoulder stock is the only thing that differentiates an AR-15 pistol from a short-barreled rifle. In legal terms, remember that you can convert a pistol into a rifle, but you can’t convert a rifle into a pistol. What Are the Advantages of an AR-15 Pistol? AR-15 rifles are lauded for their light weight, reliability and manageable recoil. So what more could you ask from a pistol? The biggest benefit is maneuverability in tight spaces. Since the barrel doesn’t stick out as far, the gun will handle better in tight spaces. You get the larger magazine of an AR without carrying the weight or length penalty. These guns are also concealable, which might be an advantage in your area depending on the legality of concealed firearms. In addition to concealed carry laws, many states have laws that restrict the type of weapon you can keep loaded in your vehicle. If you live in a state where you can’t carry a loaded rifle in your car or truck, a rifle-caliber pistol can give you a few more options. As for the performance of the gun itself, the advantages all relate to its most attractive attribute: its size. Unsurprisingly, AR pistols are lighter than your average AR-15 rifle. Obviously the length of your barrel is going to be the most important factor in the weight of your weapon, but regardless of your choice, AR-15 pistols weigh in between five and seven pounds. That’s an all-day comfortable gun, one that won’t slow you down in close quarters or out in the woods. On a certain level, any gun is only as accurate as its shooter, but that’s a cop out. How does the AR-15 pistol compare to other types of firearms? In general, a longer barrel will give you more accuracy at longer range, and that’s true here, too. At 100 yards, an AR-15 pistol isn’t going to be as accurate as an AR-15 rifle. However, at 50 yards and in, you should be happy with your grouping - at least, you won’t be able to blame it on the gun. AR-15 pistol accuracy compares favorably to other handguns. Its low mass makes reacquiring the target much quicker, so your grouping should be just as nice with an AR-15 pistol as with any other handgun. An AR-15 pistol isn’t going to make you an expert marksman, nor should it be your first choice in any sort of shooting competition. But for close quarters combat, it won’t let you down. There are ways to improve your accuracy, though. While a pistol is technically designed to be shot one-handed, or at least with your second hand supporting your shooting hand rather than the gun itself, you have a few other options for shooting stance and grip with an AR-15 pistol. 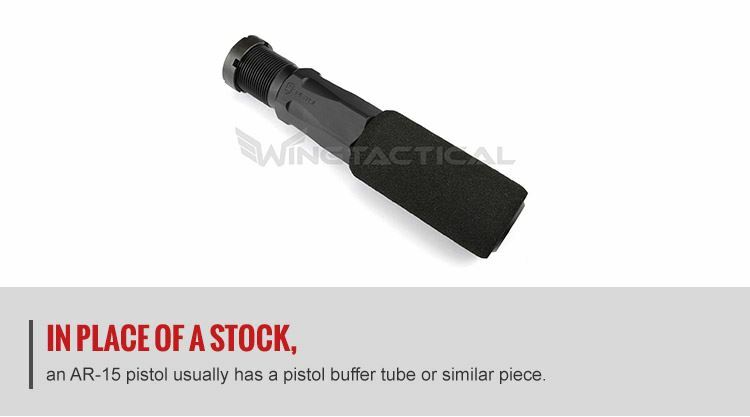 A buffer tube isn’t as effective or comfortable as a true stock, but in a pinch, it can be used to stabilize the gun against your shoulder. Additionally, you could attach a strap and then hold the gun out with the strap fully extended. The tension of the strap can help you steady your gun for a more accurate and reliable shot. One area where the AR-15 suffers from its compact size is in muzzle velocity. Shorter barrel means shorter burn, so the gas doesn’t have as much time to impart its energy on the round. This is definitely something to keep in mind when you are choosing ammunition and situations for this gun. Then again, for every argument, you can easily find a counterargument. One important takeaway from this argument is that decreased velocity doesn’t always mean decreased effectiveness. AR-15 pistols have more rails than the average pistol, so the opportunities for modification and customization are practically endless. We have plenty of options available in optics, laser sights and lights to add to your pistol. 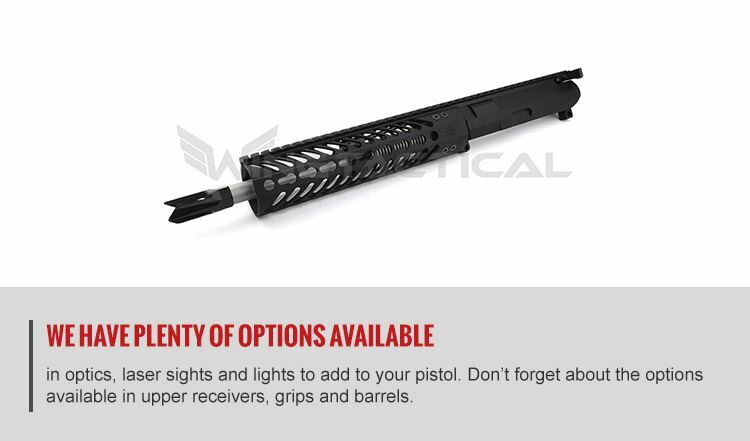 Don’t forget about the options available in upper receivers, grips and barrels. You may have one gun according to the U.S. government, but you can create what feels like a brand new gun with one shipment and an afternoon in the workshop. Additionally, while AR-15 pistols are legal generally everywhere, short-barreled rifles are not. So if you live in a state or municipality where SBRs can’t be had even with the tax stamp, sacrificing the stock and calling it an AR-15 pistol is your only option for owning this class of firearm. That alone is the only sales pitch you need if you live in one of these states. An AR-15 pistol is a viable home defense weapon, as its small size and light weight give it a maneuverability advantage over shotguns and rifles. They aren’t ideal for long-range engagement, but what pistol is? It won’t be as accurate as a rifle, and it won’t be as light as a handgun. Performance-wise, the entire thing is an exercise in compromise. This isn’t a gun you will want to rely on as your primary firearm. That said, with how stormy the seas of gun ownership have become, adding an AR-15 pistol to your arsenal will cause far fewer headaches - no special paperwork beyond the normal gun registration application, no waiting months for a tax stamp to arrive before you are allowed to enjoy your firearm. At the end of the day, the primary purpose of an AR-15 pistol is to get around the current regulations regarding short-barreled rifles. If a short-barreled rifle didn’t require an additional $200 payment to Uncle Sam, the AR-15 pistol might not exist. This isn’t to say these guns have no place in your arsenal, however. AR-15 pistols are short, lightweight and effective. 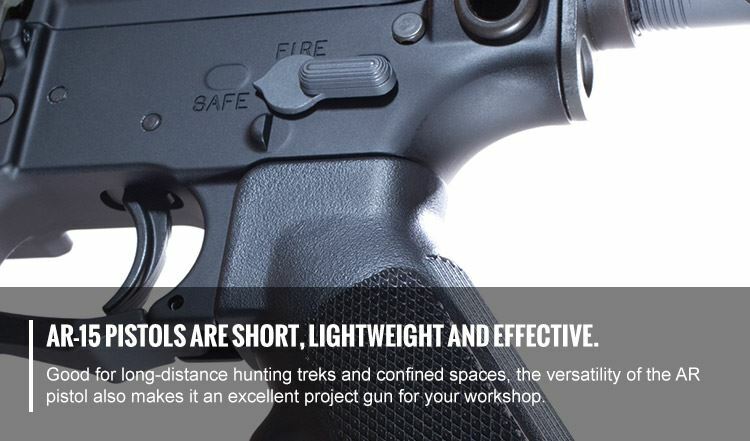 Good for long-distance hunting treks and confined spaces, the versatility of the AR pistol also makes it an excellent project gun for your workshop. You can modify your AR pistol a thousand different ways - so long as you don’t accidentally convert it into a short-barreled rifle. If you are trying to decide on the AR-15 pistol vs. an SBR, it might come down to whether or not you want to pay the extra $200 for the permission to affix a permanent stock to your pistol. Only you can answer that. If you’re interested in starting your AR-15 pistol project, there’s no time like the present. Browse Wing Tactical’s great selection of AR pistol parts and take advantage of our unmatched customer service.